Trickbox TV installs broadcast studio for Hochanda TV. London, April 2018: Trickbox TV, a leading supplier of equipment and services for studio and location multi-camera productions for broadcast, video production, webcasting and live events, has announced that it has installed a second television studio at popular arts, crafts and hobbies channel, Hochanda TV. The first studio installed by Trickbox TV was completed when the channel launched in 2015. The equipment supplied by Trickbox provides Hochanda TV with a fully integrated studio and control room including: Ross Video Carbonite vision mixer - expanding Hochanda TV’s existing Ross Video NK144x144 router; Ross Video openGear signal processing; Ross Video PIVOTCam remote cameras; Sennheiser mics and IEMs; and a Playbox playout system. 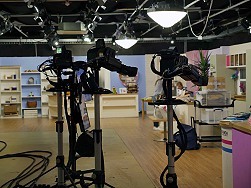 The control room furniture supplied by MW Video was custom designed to suit Hochanda TV’s unique operations. The project also included an upgrade of the existing camera robotics (in studio 1) to Ross Video CamBot robotic camera systems.